Fully equipped charter yacht / villa / hotel for the duration of the holiday (as confirmed of the Holiday confirmation). The services of representatives through our local agents. Starter pack of provisions and cleaning materials on all yachts and villas. All local taxes (Except in Croatia). Where hotel rooms are provided we will confirm the board basis and duration of stay. Fuel – Your yacht will be provided to you with a full tank of diesel and should be returned by you full. End Cleaning – This is a local charge which varies from yacht base to yacht base and will be shown on your Holiday Confirmation and Yacht Voucher. Drinks & food unless specified, excursions, visas (USD20 per person online before entry into Turkey). We will confirm whether the vessel is chartered for your sole use or on a berth/cabin basis. We will confirm on the Holiday confirmation whether any Meal arrangements are included. Your Holiday confirmation will confirm whether any amount of fuel is included for each days cruising. A Security deposit may be required for either a villa stay or yacht charter and is advised at the time of booking. The deposit is fully refundable less any amount for losses or damages incurred. You may elect to pay the Yacht Security Indemnity which operates likes a Damage Waiver scheme. This must be purchased before you travel, as it permits you to claim a refund of any deductions made from the Security deposit. The Security Deposit is lodged at the overseas Yacht base and is normally provided electronically by credit card Pre-authorization; however no funds are normally debited from your card at this stage. Should you have the misfortune to incur damage or loss of equipment from the charter yacht or a third party’s yacht, upon your return to the Yacht base your credit card will be debited appropriately up to the agreed Security Deposit. These amounts shown are for guidance only. You will be advised of the actual amount of Security Deposit required at the yacht base upon your arrival. You should ensure that you have sufficient credit available on your elected credit card. Please ensure you check all equipment is present, functional and that you understand its correct use before leaving the Yacht base at the start of your charter. By signing a Check-In form upon embarkation you are accepting the condition of the yacht and its equipment in its obvious and current condition. Report the loss or damage to the Yacht Base and/or Flotilla skipper and keep a record of the incident with times and location. Acquire a full receipt from the Yacht base clearly showing the charges incurred and a description of the damage or items of equipment lost. This should be on the Charter Company’s own headed paper. In the event of charges in excess of £500 we would kindly ask you to telephone our Reigate office (+44 1737 300805) prior to departing the yacht base as this will give us the opportunity to ensure the expenses for replacement items or repairs are of a reasonable nature. Upon your return to the UK, please forward your receipt and incident report to Sunscape Yachting and all relevant expenses less any Excess will be refunded to you. Skippered yachts are provided with professional skippers, therefore no previous sailing experience is required. Skippering a charter yacht is immensely enjoyable, but does require some previous sailing experience possibly gained by regularly cruising or racing in home waters or a previous yacht charter. Most holidays featured in our progam require a suitable yachting qualification, such as an RYA Day Skipper certificate and a VHF radio operators licence or the equivalent. In many cases local port authorities now wish to see that a second crewmember has a qualification of competent crew level or greater. As the skipper of the charter yacht you have responsibility for the safety of all persons on board the vessel and its equipment at all times. The larger bareboats require skippers with experience of handling yachts of a similar size to that being chartered and an internationally recognised qualification such as an ICC. In all cases original certificates should be taken with you. Should you have any concerns regarding the suitability of a particular holiday, yacht or cruising area, then please call our reservation team, who will be pleased to discuss the options available to you. If you are taking a flight and transfer package arranged by Sunscape the transfers to the yacht base will be provided, however if you are making your own travel arrangements, then the yachts location and our agents contact details will be provided to you with your Joining Instructions. You can usually embark your charter yacht at or shortly after 18:00 hrs (Official Embarkation or Joining Time) your last night on board is spend at the Yacht Base and you will be required to vacate the yacht by 09:00 the next morning. The yacht or villa will have been cleaned and presented to you in a safe / seaworthy condition with a full inventory of equipment, the yacht will have a full tank of fuel, water, gas and bed linen provided. On Flotilla, personal bathing towels are provided unless stated otherwise. You should bring your own Beach Towels. Further details on what to take with you, check-in procedures and itinerary information will be provided with your travel documents. will also confirm who the local operators are. has a formal sailing qualification and sufficient sailing experience to handle a yacht of the size and type being chartered and is assisted by at least one other adult acting as crew. If in the judgment of the local supplier the charterer is not competent to operate the yacht, we reserve the right to require the charterer to take a skipper at the charterer’s own expense. prior to commencement of the charter, to sign an agreement for bareboat charter which may incorporate legal requirements for yacht charter in the country in which you are chartering. will follow the operating and servicing instructions relating to the engine and other mechanical and electrical systems as advised on check-in. will inform the yacht base as soon as possible by telephone should the yacht suffer any accident, incident or failure or damage to hull, engine or gear. will not accept a tow before agreeing a towing fee. will not enter or take part in any yacht race or competition without prior express permission. will return the yacht to the marina and vacate the yacht on the last day according to the terms of the charter. In the event of late return of the yacht at the end of the charter you will be liable to a penalty charge. You have the right to inspect the yacht and all equipment thoroughly at the start of your charter to ascertain it is in good working order. Your signature on the Take-over Form implies acceptance of the yacht which will thereafter be your responsibility. For an authorised repair not carried out by the base staff, a receipt must be obtained which will be refunded in the case of repairs resulting clearly from normal and natural wear. Should your yacht suffer any damage during your charter so that you cannot use it for a period of more than 24 hours the payment for this period will be refunded unless such damage occurred through your own act or omission. As with other activity holidays, sailing contains an element of risk. Participation in sailing is your decision and at your own risk. The skipper of the yacht has primary responsibility for the safety of the crew and yacht at all times. The flotilla cruise itineraries shown on our website and on other promotional material are intended as a general guide. Sunscape, its partner sailing operators and the flotilla skipper are permitted to vary the itinerary sailed if in their opinion the weather conditions or for operational reasons make it necessary. Many of the operated holidays rely on us or the operator acquiring a minimum number of participants, from time to time we may need to consolidate flotillas or cruises. These are normally considered to be of a minor nature and we will endeavour to inform you. The holidays featured in our brochures and on our website are prepared from information gathered prior to publication and reviewed each year (October). Every care is taken to ensure accuracy. However facilities ashore, flights and travel at the destination, routes sailed, equipment provided can change. 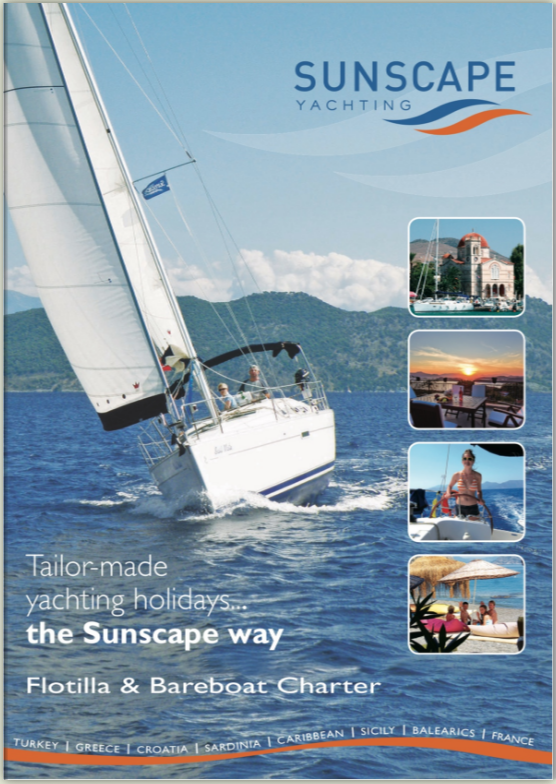 Sunscape Yachting will advise of any changes, if these are of a ‘significant nature’. You should request confirmation in writing prior to travel if a particular facility, flights and travel at the destination, item of equipment or route to be sailed is not detailed within our brochure, website or other written documentation that is connected to your holiday. From time to time Sunscape make discounted offers on our promotional material and by email, these offers can be withdrawn at our discretion at any time. Prices shown in our brochures and on our website are accurate at the time of publishing, but are subject to change. We try to absorb any differences and adverse effects incurred with currency exchange rates and fuel surcharges levied by airlines. However we do reserve the right to charge a surcharge after your holiday is confirmed. Sunscape Yachting holds an ATOL Licence 6899 and where Sunscape act as principal provider of an air holiday package, £2.50 per person is paid to the Civil Aviation Authority to provide ATOL protection for you. Visit www.atol.org.uk for more details. Many of the flights and flight-inclusive holidays on this website are financially protected by the ATOL scheme. But ATOL protection does not apply to all holiday and travel services listed on this website. Please ask us to confirm what protection may apply to your booking. If you do not receive an ATOL Certificate then the booking will not be ATOL protected. If you do receive an ATOL Certificate but all the parts of your trip are not listed on it, those parts will not be ATOL protected. Please see our booking conditions for information, or for more information about financial protection and the ATOL Certificate go to: www.atol.org.uk/ATOLCertificate"
Your contract is made with Jedlake Ltd trading as Sunscape Yachting (Company No. 04193516, ATOL No. 6899) whose principal place of business is at 4E Beaufort Road, Reigate, Surrey, RH2 9DJ. These booking conditions have been formulated as a result of our responsibilities under law. They do not affect your statutory rights. When you make a booking, you undertake that you have the authority to accept and do accept these booking conditions on behalf of yourself and your party. A contract will exist upon our accepting any moneys from you towards the booking or upon the issue of our Confirmation/Invoice. You should check this carefully to confirm that it matches what you have booked. These conditions in conjunction with the information set out in our brochure and website form the entire agreement between yourself and the company. We hold an Air Travel Organiser’s Licence number 6899 issued by the Civil Aviation Authority which provides for your financial protection and, if applicable, repatriation, in the event of our insolvency. We are also members of the British Marine Leisure Boating. When you or your travel agent make a booking with us and we accept it, you must immediately pay a deposit of 30% of the accommodation cost plus full payment for any flights, certain yacht charters may require an additional deposit. (The required amount will be advised at the time of booking) together with any applicable insurance premium. A Holiday confirmation/Invoice will then be sent to you or your travel agent setting out the balance due which must be paid no later than 12 weeks prior to departure. Payment may be made by bank transfer, cheque, debit or credit card. Credit card payments are subject to a 2-2.5% handling fee. If you are departing within 12 weeks, then the total holiday cost including any insurance premium is payable in full upon booking. If the balance is not paid on time, we reserve the right to cancel your travel and accommodation arrangements and levy the cancellation charges set out in section ‘If You Cancel Your Booking’ below. The agent on our behalf holds any moneys that you pay to your travel agent at all times. You may make changes to your booking. We will do our best to accommodate your need to make changes to your holiday arrangements. A £35 amendment fee is payable for each change made to your booking. You or any member of your party may cancel your holiday at any time providing that the cancellation is made in writing by the person who made the original booking and is communicated to us either direct or via your travel agent. You will receive a refund of the amount paid (excluding any insurance premiums and amendment charges) less the cancellation fees specified below. When only some members cancel in a group that has booked a holiday together, the charge will be based on the price of their holiday only, however under occupancy charges will apply to those remaining persons within the group. Occasionally changes may need to be made which we reserve the right to do at any time. Most of these changes are minor and we will advise you at the earliest possible date. Flight timings and carriers set out in publicity material are subject to change and all details given to you are for guidance only. Confirmed dates and times will be as shown on your ticket. Should a material change become necessary we will inform you as soon as reasonably possible. You may decide whether or not to accept the change although you must let us know by return. A material change is one made to your travel arrangements before departure involving change of UK departure or arrival airport, outward or return flights being rescheduled by more than 12 hours, or by substitution of accommodation originally booked with one of a lower grade or size of vessel. If we alter the airline, aircraft type operating your flight or routing this is not a material change and we will be under no obligation to notify you of any such change in advance. It is possible that we may be advised that the reserved yacht/accommodation may not be suitable or available to you upon arrival in resort. If this happens, we will endeavour to provide accommodation of at least the same standard in the same resort area. We reserve the right in any circumstances to cancel your holiday. However, in no case will we cancel your holiday less than 2 months before the scheduled departure date unless it is for reasons outlined in the Important Notice above or for late or non-payment by you. If we have to cancel your holiday (for reasons other than those beyond our control or for late or non-payment by you), we will offer you either: (i) an alternative holiday of comparable type, though if the alternative offered is at an additional cost, the difference will be payable by you or (ii) a full refund of all moneys paid. In either case, this will be the only recompense due to you. We accept responsibility for the negligent acts and/or omissions of our employees, agents, sub-contractors and suppliers while acting within the scope of or in the course of their employment with us and for any deficiencies in the services we are contractually obliged to provide or the failure of such services to reach a reasonable standard. In any such case our liability shall be limited to a maximum of the original holiday cost. We do not accept responsibility in respect of death, bodily injury or illness of any person taking one of our holidays except when caused by the negligent acts and/or omissions of our employees, agents, sub-contractors and suppliers while acting within the scope of or in the course of their employment agency contract of supply or sub-contract, although where the services in question consist of carriage by air, by sea or rail or the provision of accommodation, the limit of our liability shall be as provided for under applicable law and/or international convention. Where travel and health documents are necessary to comply with the requirements of any country you may wish to visit, then it is your responsibility to procure them. If failure to obtain any such documents results in fines, surcharges or other financial penalty being imposed upon us then you shall reimburse us accordingly. You must ensure by consulting your own doctor if necessary of specific precautions deemed prudent for the country/resort you intend to visit and the appropriate medications/inoculations complied with. We are neither a carrier nor a provider of accommodation. Each journey (whether undertaken or not) that you book by land, sea or air is governed by the conditions of the carrier undertaking to provide that carriage. The liabilities of air and sea carriers are generally subject to and governed by one or more International conventions. When you book accommodation (whether provided or not) its availability by provision is subject to the ‘house rules’ of the hotel or other accommodation providing or undertaking to provide such accommodation. Flight delays do occasionally happen. The airline, tour operator or main carrier responsible for the provision of your air travel may issue food vouchers or refreshments. It may also be possible for you to make an insurance claim for any flight delay. We reserve the right in our absolute discretion to terminate your holiday arrangements without notice should your behaviour be such that it is likely in our opinion to cause distress, damage, annoyance or danger to any other person. In such circumstances, no refund or compensation will be due to you. If you or any member of your party wilfully, recklessly or negligently damages any accommodation, property, harm a person, or cause delay to or diversion of any flight, cruise or other means of transport, you agree to compensate us for any loss we may suffer, including legal costs. No refund will be due to you in respect of non-utilisation of any part of the travel arrangements made for you. We do our very best to ensure that your holiday arrangements go according to plan. However, if you have a complaint arising out of what we have agreed to provide for you, please let us know at the earliest opportunity, if necessary by calling our UK office from wherever you may be. If a problem arises during your holiday, it is important that you advise the supplier and/or our representative at the earliest opportunity who will endeavour to put things right. We reserve the right to do all that is reasonably possible to resolve any problems that may arise during your holiday within 24 hours of your notification without your rights to compensation. If your complaint cannot be resolved locally you should advise us within 28 days of the incident, in writing, giving your original booking reference number and all other relevant information. Your letter will be given prompt attention. If you fail to follow this simple procedure, we cannot accept responsibility, as we would have been deprived of the opportunity to investigate the matter and hopefully rectify any problems. This contract and these booking conditions are governed by and construed in accordance with English Law. Both parties agree to submit to the exclusive jurisdiction of the Courts of England, Scotland and Wales. Where Sunscape act as an agent for another ATOL holder providing a flight inclusive holiday financial protection is provided under the tour operators own ATOL.